It’s a very significant night. 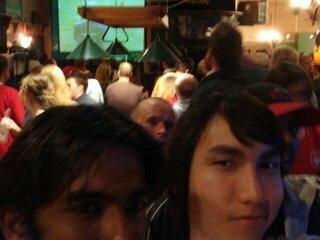 It’s the FA Cup Final, it’s the first night I got to watch football in Wellington, it’s the first time I went out wif the chef of Istana Malaysia, that Nesa keeps talking about, and it’s the first time I’m in a sport bar ever! Courtenay Arms is an English bar on Allen st, right next to Satay Kampong, my workplace, and down the street from Istana Malaysia, Nesa’s work place! I really enjoyed the atmosphere of the place. It’s as if we were actually in the stadium! It was filled with Caucasians male and female, all dressed up in football jerseys, chanting and shouting and ranting and groaning and reacting to the play projected on the big screen. I REALLY LIKE THE PLACE!!! I’m looking forward to the Football World Cup! Gonna look for a nice sports club with my mates, grab a beer and watch some of the best football in the world!